I was curious about this when the word started surfacing in my wedding decor research. A quick Google Search and I understood the appeal- Bunting is easy to make, colourful, inexpensive and very charming. “Bunting” is a term for festive decorations made of fabric, plastic, paper. Typical forms of bunting are strings of colourful triangular flags, also known as pennants, and lengths of fabric gathered and draped into swags or pleated into fan shapes. Whether you are decorating for a summer picnic, baby shower, birthday party or wedding- this simple DIY project can lend a festive spirit and decorate the least festive of venues! Bunting could even be used a Wedding Motif- you could make your own invitations using paper scraps and a ribbon. 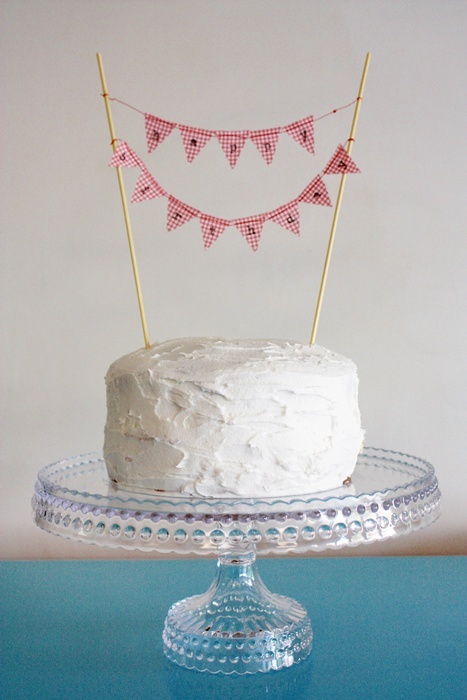 You can make miniature bunting for the top of the cake. Strings of bunting can decorate the head table, bar area, entry way and can even be used as a backdrop for a photo booth. I was going to come up with instructions for simple bunting but in my search I found this tutorial. This Blogger does a great job of explaining it all. I will direct you to her tutorial at Navy Bean Online. Her basic instructions can be modified to different sizes, materials and purposes. For a totally no-sew version you can use paper triangles, a hole punch and a thin ribbon. Punch a hole in each of the corners on the short side and string the ribbon through. All these great pictures and instructions are making me anxious to throw a party so I can decorate with bunting! They can be made with minimal cost and can be used over and over again. Consider making a string of them to decorate for a baby shower and then using them to decorate the nursery after the baby arrives. This could also be a great DIY project for bridesmaids before the wedding. Thanks so much for recommending my tutorial! 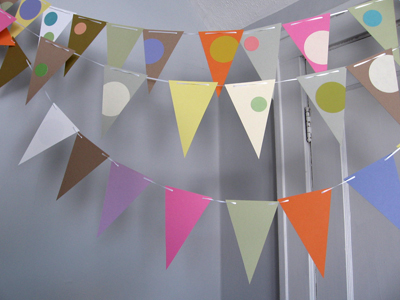 I love bunting… it’s so easy to make and really adds such ambiance to the party! No problem- Thanks for the valuable information!